What would you do if you met your favourite singer or band? Would you agonise over the killer question no one had ever thought to ask? Would you try to be their new best friend just in case you might get an invite to hang out at the mansion over the weekend? Would you be struck dumb in awed silence? Or, as the lady in the Meat Loaf documentary ‘In And Out Of Hell’ did, burst into tears and thank them for all the unspoken moments in your life where their music made a difference, even though you could never explain to anyone, not even your closest partner, why? I sometimes think that being a true fan, (not in some crappy, snobby, purist sense, but just looking up to someone who really matters to you) is like re-coding part of your DNA. You evolve with or from those memories so that the artist quite literally becomes a part of you in a way that is unique. No one else will ever know how you felt listening to that song, thinking about that girl or boy, clutching an album sleeve whose lyrics you could recite backwards, lying on your bed and just staring into space as time passed slower than anything you thought possible. This Meat Loaf documentary from the BBC actually showed over Christmas but I only got chance to watch it today, crashing out after a long, windy training ride. These are the things that lazy afternoons are made for! Normally, these retrospectives are excruciatingly dire, little more than a rehash of music videos and current Z-List celebrities reading from the autocue about how they’ve always loved XYZ or “explaining” the lyrics for anyone who’s been living on Mars for twenty years. But this was actually a really good review piece with lots of interesting interviews from all the key players, recollections from childhood friends and archive footaged. I was saddened to see that Meat Loaf is looking a bit frail these days due to persistent knee and foot problems. And one suspects that the scant footage of shows in the US last year, strictly limited to pre and post performance, are out of respect to a voice that, prone to live wobbles even in the halcyon days, is a pale shadow of its former glory. But even if that’s true, the man has nothing to be ashamed of. For me, Meat Loaf was never a star whose legend was honed and polished in the crucible of live performance anyway. In the age of downloads and playlists, there probably never will be another rock and roll album like ‘Bat Out Of Hell’ that sells in such colossal numbers, and certainly none quite so singular and unique. Over the years, I’ve rejoiced in a lot of music, in so many genres, that it’s hard for me to pick a favourite or even a group of favourites. But ‘Bat Out Of Hell’ will always be my undeniable first true, head-over-heels, musical love. At the age of 10 or 11 years old, my Mum and I used to listen to it when driving to Burscough to see my grandparents and I can still remember the look and feel of that old tape cassette that we played until it wore through. Those journeys were some of the best times of my childhood, a key part of that glue that binds the glitter of who you are, as Mum patiently endured all my ‘growing up’ questions and we listened to ‘All Revved Up With No Place To Go’ without it seeming autobiographical….yet. And I also recall trying in vain to copy the sleeve of the ‘Dead Ringer’ album and draw the perfect, gothic facsimile of the Meat Loaf logo. We had an all-purpose, orange jotter notebook at school and there was one especially awkward conversation I had with the teacher who handed them out, (curiously, another Mr. Dodd, no relation), trying to explain why in the space of a week, I needed a fresh one to replace the one I’d filled with copies of the Meat Loaf, Yes and Saxon logos. In 1984, when Meat released the ‘Bad Attitude’ album, I won a competition on the BBC’s ‘Old Grey Whistle Test’, and had my name read out by Paul King who became far more famous as one of the first MTV VJ’s than he ever did as the lead singer of his eponymous band, King. My friend, David, and cousin, Ian, went to see Meat Loaf on that tour at the Manchester Apollo, where we had second row seats and could almost reach out and touch the great man. I remember being terribly impressed by the female backing singers and swore blind after the show that eye contact had been made and held with the younger, cuter singer who resembled an impossibly-out-of-reach older sister’s best friend. My father and uncle waited for us in a bar around the corner and complained bitterly after the show that it had sounded like the concert was being ‘piped in’. What did we care? Driving home, I felt I could truly see paradise by the dashboard light. And I was all of fifteen years old. Even now, listening to ‘Bat Out Of Hell’, ‘Paradise’, ‘Hot Summer’s Night’, the hairs rise. There is a freshness and an exhilaration about the music that decades later, thrills me in a way few other albums or artists do. 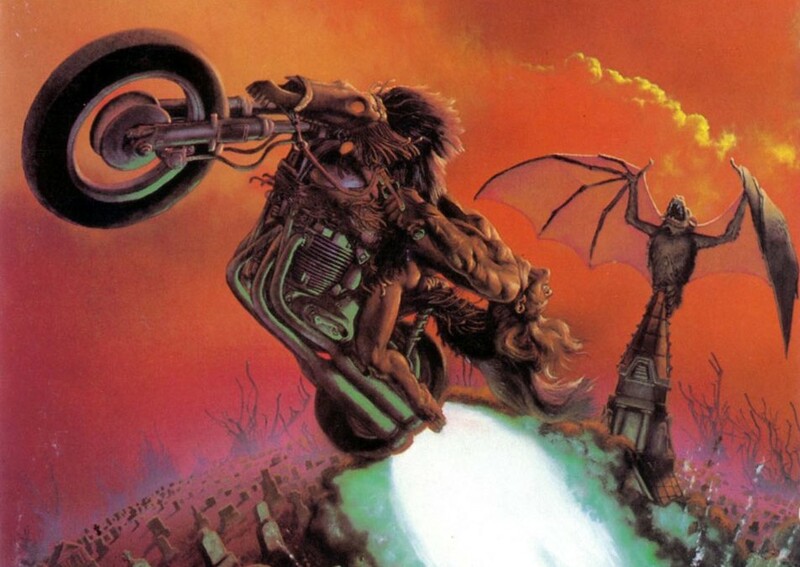 ‘Bat Out Of Hell’ in particular will always be in the mythical ‘All Time Top Ten’ or ‘Desert Island Discs’, but the rest of the album is just so complete as a whole that I can’t imagine breaking it apart and listening to it separately or in a different order. It would feel completely wrong. What would I do if I met Meat Loaf? Probably say thank you for more than I could explain and leave it at that. I think my British reserve would get in the way of trying anything more ambitious, and like the lady in Vegas, I think I too would be susceptible to the tears, which simply wouldn’t do at all. I’ve been listening to Meat Loaf for nigh on thirty five years and I guess I’ll never stop. Because after all, I’d do anything for love, but I won’t do that!